One of the first things you're told when diagnosed with PCOS is to make some healthier lifestyle changes. PCOS (polycystic ovarian syndrome) is all to do with abnormal hormone levels in the body, including high levels of insulin. Insulin is a hormone that controls sugar levels in the body, but many women with PCOS are resistant to the action of the insulin in their body and produce higher amounts of the hormone to combat this. This then contributes to increased production of hormones such as testosterone. Regular exercise has been shown to help the body respond better to insulin and balance out hormones! This can not only help PCOS symptoms but also reduce the risk of possible side effects and complications such as reduced fertility, diabetes and depression. I've personally found exercise to be absolutely necessary in order to keep my PCOS symptoms and pain at bay, it most definitely helps with my mental health and I really feel the negative impact when I don't exercise for a while. That being said, you do have to be a little careful with your exercise regime and find a healthy balance that suits you delicate body! When I was first diagnosed with PCOS and told to exercise more I thought 'the more the better'. I believe the more I exercised and the more intense the workouts the better it would be for my body. so I jumped straight in with 5-6 HIIT sessions a week! At the time I didn't see anything wrong with this, however when I was doing this I lost probably too much weight, I lost my period and my energy levels were pretty low! When I looked into HIIT and PCOS I found that HIIT actually puts your body under a huge amount of stress and strain. It ultimately increases our cortisol levels which is NOT good for PCOS and can cause all sorts of problems. That isn't to say HIIT should always be avoided but doing it more than 3 times a week isn't recommended to anyone, especially if you have a hormonal imbalance. Once I finally released my daily HIIT sessions weren't doing me any favours I started switching out a few of the sessions for different forms of exercise. Yoga and pilates are two forms of exercise I swear by! I tell everyone to give them a try, but especially if you're suffering with a hormonal condition and/or mental health problem these less high impact forms of exercise will be a god send! 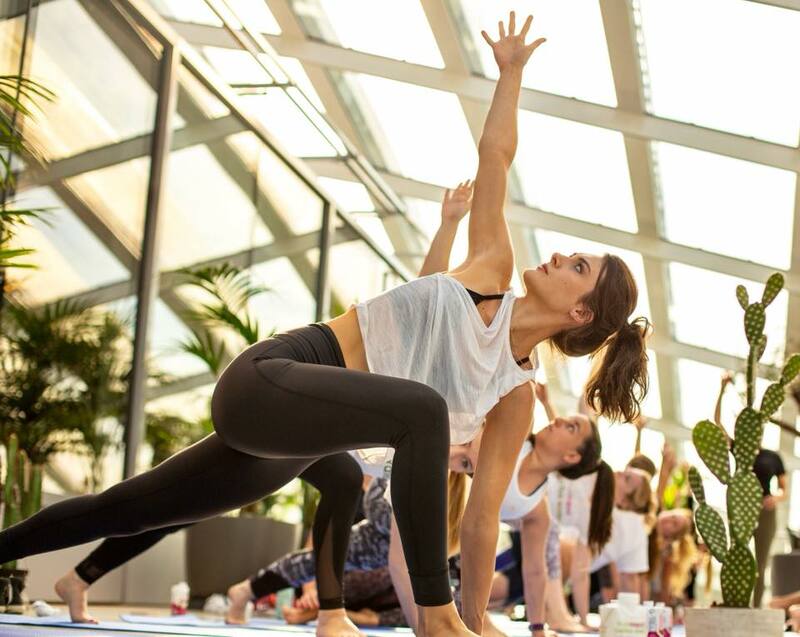 Yoga and pilates are not only much more gentle on the body physically but they can do wonders for the mind, and it's actually been scientifically proven they can reduce your stress levels after just one session. They'll also help valuably with bloating/digestive issues, which many women with PCOS can suffer with. Strength training can also be massively beneficial and I personally LOVE the feeling of lifting weights! I feel strong and empowered, which is just the greatest. Strength training can also help keep you at a healthy weight, can reduce insulin resistance and boosts your metabolism. However, in my opinion it's all about finding what works for your body and what you enjoy! Enjoyment is key in exercise, especially when you're trying to keep your stress levels under controlling. There will be at least one form of exercise out there that you enjoy, it could be the ones I've mentioned or perhaps you like to power walk, attend a Zumba glass with your girl friends, maybe you love to cycle, hike or swim. Boxing could be your thing, you might love rowing, running or dancing! There's so many different things you could be getting involved in! Exercise is key to a happy, healthy life and it certainly is tremendously important if you suffer with PCOS. Don't shrug it off and think it couldn't possibly help, because trust me....it does.